Scoliosis is an abnormality of the spine, which in some cases can lead to serious trouble. Let’s see what happens, and why, when the spine is curved more than normal. 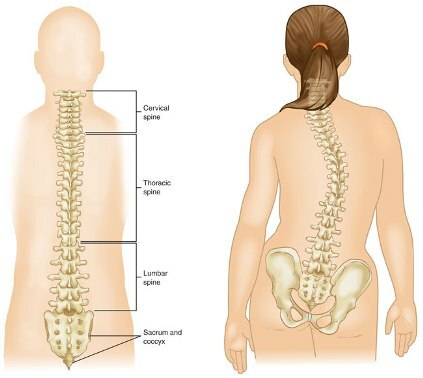 The spine is not perfectly straight, but has three slight curves that allow better distribution of body weight. In some cases, the column is bent to one side, which can lead to discomfort medium or long term. Generally, the scoliosis progresses throughout life, especially at puberty. When ending this stage, however, it slows the deviation. Let’s see, then, some of the main characteristics of scoliosis and its symptoms, as well as the most appropriate treatment to treat this problem effectively. It’s more than a back pain. Scoliosis means an alteration of the normal structure of the spinal column. Anomaly that involves the torsion of the spine on itself in a more or less marked curve. In most cases it appears in childhood or during preadolescence stage. Generally, scoliosis in children is mild and causes no problems. Although it is more rare, it can be reached adulthood with scoliosis, especially when it’s not diagnosed in adolescence or degenerative processes of the vertebrae. When we talk about the profile of the patient diagnosed with scoliosis, statistics confirm that women are more prone. The causes are, in a high percentage, unknown (over 80% of cases), so we talk about the so-called idiopathic scoliosis. Among the risk factors, however, should not be underestimated family history of scoliosis. If one parent, or both, or some of the direct family members suffer from this disorder, the chances that children have the same problem. Although from childhood we learn to care for our back, especially the positions we adopt, maintain an uncomfortable position for the back for a long time is not cause of scoliosis, although it may aggravate the symptoms. Another widespread belief, and also wrong, is attributed to the weight of the backpacks of children is the problem of scoliosis. Excessive weight or carry misplaced can cause discomfort in the back, but is not responsible for scoliosis. Barely recognizable in the early stages, symptoms may go unnoticed, that is, not be attributed initially to a scoliosis problem. Some identifying signals are, for example, have one shoulder or one shoulder higher than the other, or the appearance of a hump or bump on the back. If you ignore the symptoms and not the problem is diagnosed, Scoliosis tends to progressively worsened, which can lead to unpleasant consequences in adulthood. To establish the treatment to be followed is considered the so-called Cobb angle, a method of measuring the degree of curvature of the spine. Scoliosis between 10-15 degree does not usually require treatment. If the curvature is between 20-40 degree, it will recommend the use of back brace. This brace does not straighten the spine, but it prevents that the curve steepens. An angle of 40 degree may require surgical intervention. « Hypermenorrhea: What it is?